Security in eForms Lite and Basic is limited to locking the current and user databases so that they can be accessed only from within eForms. The Data File Security option in eForms Standard and Enterprise can restrict access to any database to selected users. When the "Restrict access to the current database" option has been selected, only users with a check beside their name will be able to access the current open database. 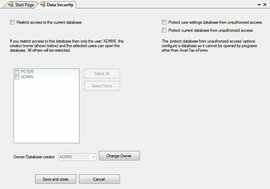 Use the "ADMIN" user account to set access restrictions for any database, regardless of ownership. The owner of a database, typically its creator, has the ability to set access restrictions for that database. The ownership of any database can be changed to enable any other user the ability to set access restrictions.